Commerce Secretary Wilbur Ross testifies before a House Committee on Appropriation subcommittee hearing on Capitol Hill in Washington, March 20, 2018. The U.S. and the European Union are set to engage in a new round of talks to resolve trade disputes, including those over U.S.-proposed tariffs on steel and aluminum imports. “We have agreed to launch immediately a process of discussion with President Trump and the Trump administration on trade issues of common concern, including steel and aluminum, with a view to identifying mutually acceptable outcomes as rapidly as possible,” a joint U.S.-E.U. statement said Wednesday. The announcement was made after talks in Washington between Commerce Secretary Wilbur Ross and E.U. Trade Commissioner Cecilia Malmstroem. U.S. President Donald Trump’s announced tariffs on aluminum and steel imports are scheduled to take affect later this week. Washington already temporarily exempted Canada and Mexico from the tariffs during talks to renegotiate the North American Free Trade Agreement. 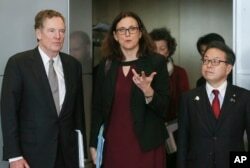 EU Commissioner for Trade Cecilia Malmstroem, center, Japanese Minister for Economy, Trade and Industry Hiroshige Seko, right, and US Trade Representative Robert Lighthizer, pose for photographers prior to a meeting at EU headquarters in Brussels, March 10, 2018. U.S. Trade Representative Robert Lighthizer said in congressional testimony Wednesday the administration is currently discussing tariff exemptions with Argentina, Australia and Brazil. Lighthizer also told lawmakers he expected a decision soon from Trump on tariffs on imports from China, which Washington accuses of stealing U.S. intellectual property. The Trump administration’s aggressive actions on trade issues have triggered alarm among legislators in the president’s own Republican Party and among industry groups who say the tariffs exposes the U.S. to higher prices and potential trade wars.